The Citadel, Ancient City and Fortress Buildings of Derbent are part of a strategic Sasanian defence system from the 5th century. Derbent is situated on the western shores of the Caspian Sea, in present-day Dagestan. It was in the position to control the traffic between Europe and the Middle East, and shield the prospering agricultural peoples of the Middle East from devastating raids of nomadic tribes from the steppes of South-Eastern Europe. The defence structures that were built by the Sasanians were in continuous use by the succeeding Persian, Arabic, Mongol, and Timurid governments. Its militairy function lasted til the 19th century. Its name is a Persian word: “Darband”, meaning "closed gates". Two parallel defence walls, 3.6km long, stretching from the sea up to the mountains. They were built from stone and had 73 defence towers. 9 out of the 14 original gates remain. Naryn-Kala Citadel: most of the old buildings, including a palace and a church, are now in ruins. It also holds baths and one of the oldest mosques in the former USSR. the ancient City, between the two walls, holds interesting courtyard houses, mosques, baths, madrasahs, and the remains of a caravanserai. Many think that a visit to Derbent is our of the reach of an independent Western traveler. Dagestan has a very bad reputation as a troublesome region with high crime rate and as a source of jihadist threat. Practically all Western countries issued travel warnings, discouraging travelers to go there, and even Moscovite Russians have a firm conviction that Dagestan is a dangerous place. But -if you venture to go there - literally everybody will try to convince you that there is no calmer and friendlier place on Earth than Dagestan. And after two days I was ready to believe rather them than my own bureaucrats in the ministries. But let us see the practical side: Travelling to Dagestan is not difficult at all, there are no restrictions, extra permits, checkpoints, you can get the visa with the normal procedure, and travel around freely. From Moscow there are a lot of flights daily to Mahachkala. If you book the ticket well in advance a fares are quite low - 40-60 euros one way. I was flying Utair, a low cost company based in Moscow's Vnukovo airport. (Advisable for those who understand Russian as they do not have English website.) From Mahachkala airport you have to take a taxi to the bus station (avtovokzal), from where there are innumerable marshrutkas going to Derbent. As a rule they leave when full, but normally as I realized you don't have to wait more than a couple of minutes. The bigger ones (Gazella minibuses) cost 200 rubles (3 EUR) per seat, but they make the 170 km-s in 2-2,5 hours. Faster, more comfortable shared taxis cost more -cca 500 rubles (7,7 EUR) per person. As you arrive to Derbent you have to take another taxi to your hotel. Taxi rides within the town cost somewhere between 80 and 160 rubles 1-2 EURs so it is really not necessary to walk anywhere if you are not into it. Accommodation cannot be a problem - there are a lot of local hotels, guesthouses on booking.com. Prices generally are much lower than anywhere else in Russia, Dagestan is still among the poorest regions of the country - it will be a relief after th skyrocketing prices in Moscow. The Old Town is easily walkable, but the Naryn-Kala fort is on the top of a hill, and can be quite exhausting experience to walk up there in the summer heat. The fortress is heavily reconstructed but retains some traces of the olden ages -it worth the 500 rubles, and you can easily spend there 2 hours. An ambitious reconstruction project is (or rather was) on the way. Parts of the city walls and some streets are nicely restored. 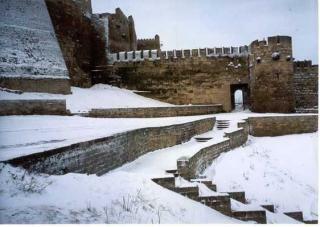 An impressive staircase leads along the wall from the fortress towards the center. But it ends halfway in a clamped backyard. Juma Masjid - the other crown jewel - is much more atmospheric place, than the fort. It's the oldest mosque of Russia and the interior is really stunning . Unfortunately taking pictures inside is forbidden. Though there are some Russians who still dare to come, Dagestan is absolutely off the beaten track. You have to be prepared for quite limited tourist facilities - no souvenir shops and fridge magnets - the only tourist spot is in front of Naryn-Kala (on the picture) - but the obligatory accessories of the 21st century are present from ATMs to diet coke. The good command of Russian makes it hassle-free - but I am sure that you can survive without Russian also. Getting back to the airport is easier as it is on the way to central Mahachkala, so most probably your driver will drop you there without any surcharge. I have been there 4 years ago. I worked for a private Turkish University named International Eastern University as a lecturer. I tought there some accounting lessons. I always miss the days I lived in Derbent and miss the students. 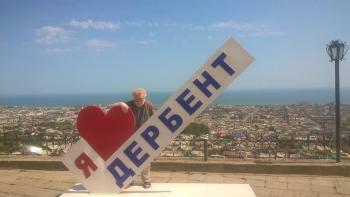 Who ever loves and saves Derbent, I love him/her. Frontier walls: The 2 walls within which the city developed were "part of the northern limes of the Sasanian Persian Empire, which extended to east and west of the Caspian Sea"
Golden Horde: "defined the territory ..as extending ? in breadth from Bulghar to the Iron Gate [Temür-Qahalqa or Derbent]." Alexander the Great: Has been linked to the location of the Gates of Alexander, the legendary barrier supposedly built by Alexander the Great in the Caucasus to keep the non-Greeks of the north from invading the land to the south. Mosque: ?Djuma-mesjid? is one of the earliest mosques in the former USSR. It probably dates from the 8th century, though renovated or rebuilt in the 14th and 17th centuries.